Virginia King has been invited by the Global Art Foundation (GAA) A to exhibit in PERSONAL STRUCTURES, a prestigious 2019 Venice Biennale Collateral exhibition, hosted by the European Cultural Centre. The exhibition runs from 11 May to 24 November 2019. As the only artist from New Zealand invited by GAA to exhibit sculpture during the 2019 Venice Biennale, this is an honour, international recognition and a celebration of three decades of her practice. Virginia will exhibit an installation of four works and a video in Palazzo Bembo, a fifteenth century building adjacent to the Rialto Bridge on the Grand Canal. Virginia’s patrons will be personally invited to join her in complementary celebratory evenings in Venice. The cost of creating, exhibiting and shipping the sculptures are considerable. To assist with funding, the major works in this exhibition will be pre-sold as well as works from the artist's archive. View the available works below. The shell cradle that protects the eggs of the female Paper Nautilus defines the form of Southern Nautilus. The spiraling text is sea-sounds, lists of words about the ocean. References include coastal places that have influenced Virginia’s life and the childhood memory of listening to the sea, holding a shell to one's ear. The text also references navigation, endangered sea life and plunder of the ocean. The branching vessel form of Phantom Fleet speaks of environmental migration, endurance and loss, while interpreting the relationship between nautical, botanical and anatomical forms. Phantom Fleet represents boat hulls and empty seedpods, water, land, migration and growth. This perforated double-sided work references marine protozoa; micro-organisms with intricate silica exoskeleton. Pacific Radiolaria draws attention to life forms dependent on the balance of temperature, salinity and nutrients in the world’s oceans. Fossil-forms of Radiolaria date from the Cambrian era. Radiolaria Maquette references marine protozoa, micro-organisms with beautiful and complex silica exoskeletons. This work draws attention to fragile life forms dependent on the balance of temperature, salinity and nutrients in the world’s oceans. The double sided circle of twigs and branches forms a delicate assemblage, referencing bare winter trees. The circular mandala form speaks of the longevity of trees, changing seasons and the cycle of life. Heart of Oak alludes to ancient mythologies about Oak trees in Roman, Greek, Celtic and Teutonic cultures. Sliver Maquette invesigates genetic pools and the complex structure of micro-organisms, and can be viewed as an archetypal symbol of time. The central aperture plays with the concept of a lens, to focus outlook and perception. Celtic imagery that evokes the circular movement of sea, sky, strength and resistance is combined with traditional pacific weaving patterns. At the heart of Navigational Orb the Celtic cross signifies time, navigation and the four seasons. This cross predates Christianity and alludes to the four elements in ancient Greek mythology, fire, water, air and earth. Maritime navigational systems and instruments of vintage astronomy are also suggested. to New Zealand, and have a wing span of around 100mm. 1.5mm 316 Marine Grade Stainless Steel. Laser cut and hand-finished. Celtic imagery that evokes the circular movement of sea, sky, strength and resistance is combined with traditional pacific weaving patterns. At the heart of Navigational Orb the Celtic cross references time, navigation and the four seasons. Cicada song heralds the arrival of summer. Cicada is a celebration of regeneration and seasonal change. Throughout history, the Cicada has provided a rich metaphor, symbolising resurrection, immortality and transformation. Branching Vessel is the maquette edition of Phantom Fleet. The work speaks of environmental migration, endurance and loss, while interpreting the relationship between nautical, botanical and anatomical forms. Branching Vessel represents boat hulls, empty seedpods, water, land, migration and growth. Virginia King in her Waiheke Island Studio. Image courtesy of Gulf News. Over the past thirty years Virginia King has been commissioned to create an extensive portfolio of large-scale, site-specific works for public locations and private collectors. Major commissions include Willinga Plume, at Canberra Airport and Reed Vessel, in Melbourne’s Docklands, Woman of Words, in Wellington and Heart of Oak, at Ohinetahi, Christchurch. Virginia has designed two significant public footbridges in Auckland; Rewarewa Creek and Aramarama Millennium. Her works are exhibited at Connells Bay Centre for Sculpture, Waiheke Island and at Brick Bay Sculpture Trail, Matakana, including a major earth work, Koru. In 1999 Virginia was awarded an Antarctic Artist Fellowship, a pivotal experience within her practice. Following her residency in Antarctica, scientists sent electron microscope images of diatoms, (algae at the beginning of the food chain) to inform her celebrated Antarctic Heart series. Virginia’s work continues to reference marine micro-organisms, corals and foraminifera. Her vessel forms metaphor exploration and migration, nurturing and protection, life and survival. These works bring to attention the fragility of our environment and the urgent global need for stewardship and conservation. Virginia is honored to be invited by the European Cultural Centre to exhibit during the Venice Biennale, 2019. This invitation is a powerful affirmation and celebration of her extensive body of work and position as one of New Zealand’s leading sculptors. 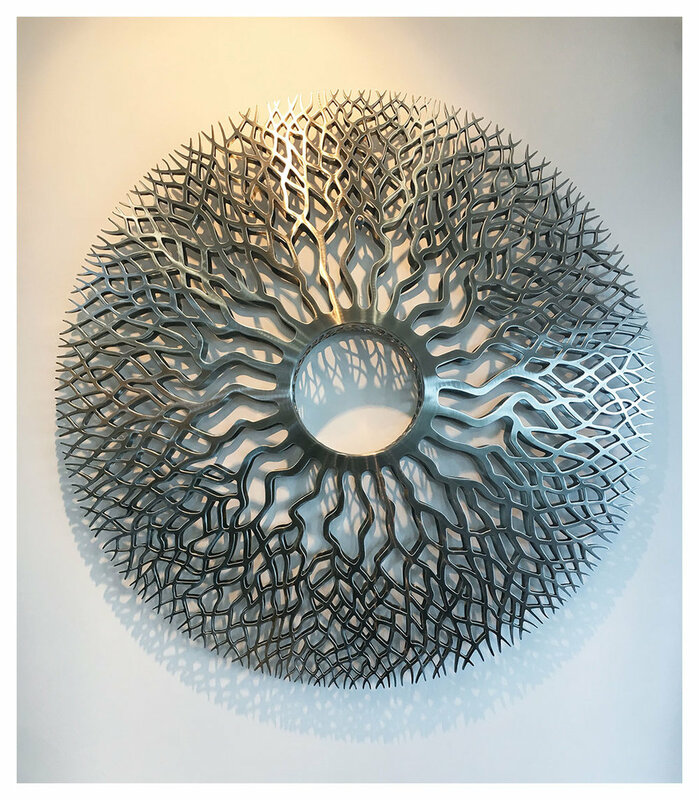 In this collateral exhibition Virginia aspires to raise awareness of environmental issues and create further interest in New Zealand sculpture.